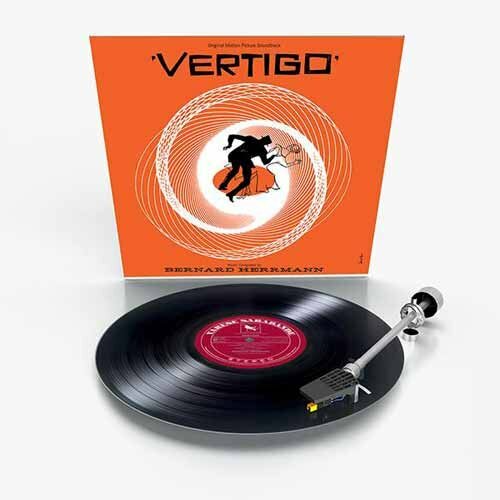 Along with the composer's work for Psycho, Bernard Herrmann’s score for Vertigo is widely regarded as one of the greatest pieces of film music ever recorded. I remember the first time I saw the movie on TV and one of the main things that stuck in my mind was the music. Unsettling, yet emotionally uplifting. It was instrumental (if you'll pardon the pun) in creating a suspenseful atmosphere as well as making the audience empathise with James Stewart's character as he wrestled with both his phobia and love of a mystery woman. How it didn't win an Academy Award is still a mystery to me. There's been a few releases of the soundtrack over the years including a version performed by the Paris Opera Orchestra, conducted by James Conlon, as well as a version conducted by Joel McNeely and performed by the Royal Scottish National Orchestra. The original studio recording, as presented here, was also given an expanded CD release by Varèse Sarabande in 1996. This vinyl reissue consists only of the original 1958 soundtrack program. The score was composed between January and February 1958 in London and Vienna after a musicians’ strike prevented the score from being recorded in Los Angeles. The original stereo masters were uncovered at Paramount Pictures during research conducted over the two-year-long film restoration of the movie's film print. Completionists will already own the previous extended CD release of this album, but if you want to hear the soundtrack as movie fans would have heard it on vinyl when it was originally released this is an essential purchase. This is one score that just gets better the more times you hear it. It still sends shivers down my spine.